And that latter situation is what brings us to the famous woot-off, because woot needs to do something with the inventory that even they can’t sell. A woot-off is when woot goes crazy in trying to sell as much of their excess inventory as possible, as quickly as possible. 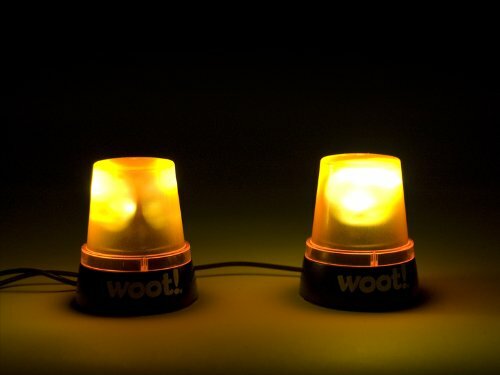 Unlike a normal woot sales cycle, where woot sells just one product a day, during a woot-off woot will put a new product up for sale as soon as the previous product has met its sale goal. A woot-off could last just a few hours, or all day long. Nobody ever knows how long the woot-off will run, or what other pleasant surprises could be just around the corner if another 10 people buy a few more of those $1 camera tripods to empty the inventory. 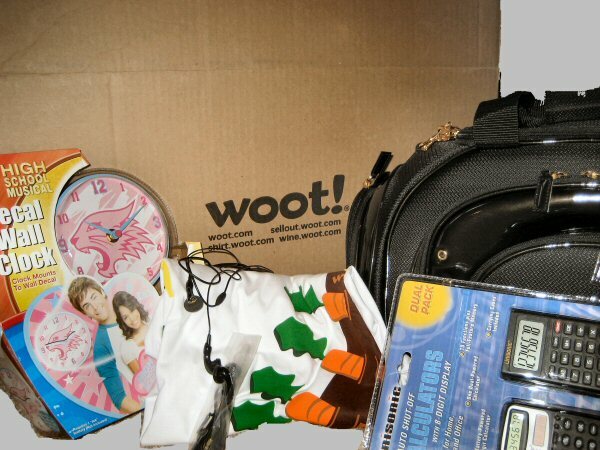 The holy grail of a woot-off is the infamous woot BAG OF CRAP. They’ll usually only appear once during a woot-off, and they are extremely limited. It’s your basic mystery grab-bag, priced at just $3 (plus $5 shipping). You never know what you’re going to get in your BAG OF CRAP, but you’re often guaranteed to get at least three items that are worth at least the $3 you spent to get it. Web Watch was able to grab the elusive Bag of Crap on our very first try. Woot! indeed. Two sets of Sansa earhones, perfect for iPod or MP3 players. One set new in plastic wrap, the other set damaged with missing ear foam and exposed wiring. A black nylon and shiny black plastic travel bag, with bright gold accents. Perfect for the gym or an overnight trip. Why a bag? Because every Bag of Crap comes with a bag of some sort – hence the name. An exclusive woot.com “Bandolier of Carrots” t-shirt, size L.
Not a bad haul for $3 plus shipping, we say. Other Bags of Crap have been reported to contain new MP3 players or other electronics, screaming monkeys, and other interesting stuff. It’s always going to be worth the mystery – as sometimes woot will “award” a lucky Bag of Crap recipient with a 65″ wide-screen LCD televisions or pallets of toys. Items like these won’t be shipped as part of the standard Bag of Crap shipment, but would come with a special “Letter” from woot indicating that you’re going to be receiving more stuff. The famed television delivery aside, as an example of what you might get – one lucky person received 42 coffee makers over the course of a week. But really, anything B-o-C related will work. Woot also has wine.woot.com for wine and gourmet-food related items (limited shipping area for alcohol, unfortunately), and some other specific sites. Be sure to check woot.com every day for awesomeness and try to score that Bag of Crap on its next go-around.